If you are in Atlanta on November 4, 2010 at 11:00am, you should go to the Georgia Tech Barnes and Noble Bookstore, 2nd floor Technology Center, to hear a book talk by Professor Lisa Yaszek and Brittain Fellow Rebekah Sheldon. 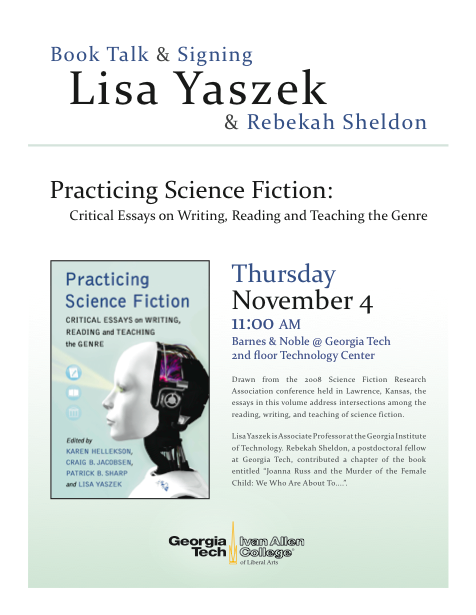 Prof. Yaszek is going to talk about her role as co-editor of the Practicing Science Fiction: Critical Essays on Writing, Reading and Teaching the Genre anthology in which my essay “Revealing Critical Theory’s Real-Life Potential to Our Students, the Digital Nomads” appears. Sheldon will present on her essay, “Joanna Russ and the Murder of the Female Child: We Who Are About To,” from the anthology.